Born and brought up in Mumbai, India, Swamiji ventured overseas and completed his Commerce degree from the University of Sydney. After attending a Chinmaya Mission Youth Camp conducted by His Holiness Swami Swaroopananda, Atulanandaji began his journey into spirituality. 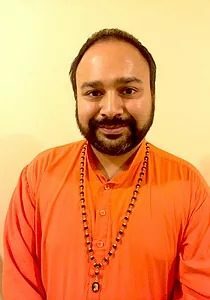 His desire for this knowledge grew when he became a regular member of the Chinmaya Yuva Kendra or CHYK the Youth Group of Chinmaya Mission, in Sydney where he continued attending weekly study groups and participating in the service-oriented activities. Through the youth group, he became inspired by the life, work and vision of H.H. Swami Chinmayananda, the founder of the Chinmaya Mission. Thereafter, on the completion of his degree, his quest and inspiration lead him to Sandeepany Sadhanalaya, Chinmaya Mission’s headquarters in Powai, Mumbai, where he completed a two year intensive Vedanta Course in 2004 under the able guidance and tutelage of His Holiness Swami Ishwarananda. Here, he undertook an in-depth study of the Sreemad Bhagavad Geeta and many Upanishads in Sanskrit. the Resident Acharya of Chinmaya Mission Auckland. Since 2004, Brahmachari Adarsh Chaitanya had been conducting weekly spiritual classes for children, youth and adults along with camps for youth and children and conducting talks on various topics of Vedanta. During Pujya Gurudev Swami Chinmayananda’s Birth centenary year (2016) on the auspicious day of Mahashivaratri, Brahmachari Adarsh Chaitanya was ordained into Sannyasa ashram (the 4th Stage of life) by His Holiness Swami Tejomayananda, and was named Swami Atulananda Saraswati. Swami Atulananda continues to serve as the acharya of Chinmaya Mission Auckland since. For more about the classes held in Auckland by Swami Atulananda please follow the link below the picture.